I studied for several years at Hornsby TAFE ceramic department, where I learned many different techniques of working with clay. I was most often drawn back to hand building which I find contemplative and relaxing. About 7 years ago I discovered a way of working clay that was unusual but highly enjoyable to me and I have been exploring its possibilities every since. In my ceramic work I test the plasticity of clay to its limit. My method of pleating clay has me pinching, folding and pressing with the heel of my thumbs each piece of clay. 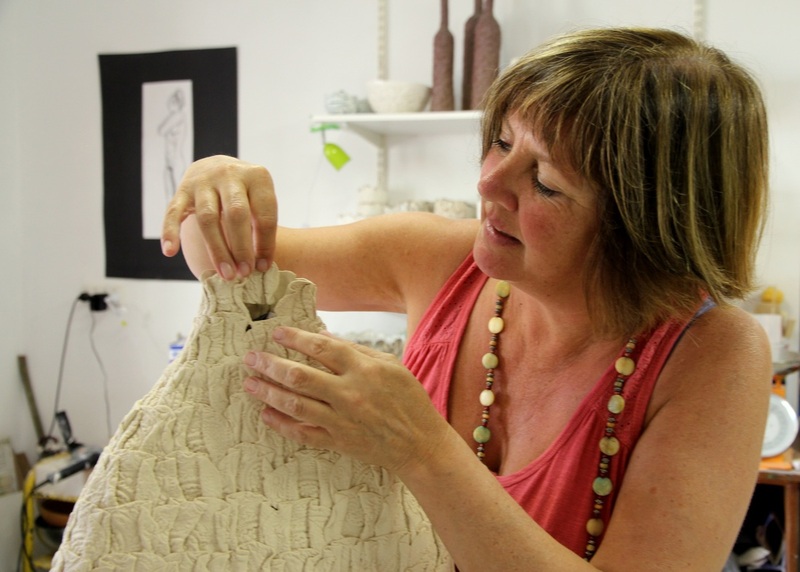 I work quickly, gently pressing each clay piece into place. If it is a warm day and the clay is drying too fast I will use a spray mix of water and vinegar to keep the clay sticky. Working this way I feel a connection to the finished piece that is enormously satisfying as I leave my fingerprints subtly on the work. The Southern Ice porcelain I work with is very white and highly translucent. As a result, I am continually looking for the best form to show off this translucency and the textural shadows the pleating creates. Sometimes I add extra texture taken from old wooden batik blocks or corrugated cardboard, and press the flattened clay into this before folding it. For my lamps I am currently exploring vessel forms that might have been water carriers in the past, and transforming them into 'light carriers'. The extreme thinness of the clay means that the forms inevitably alter in the firing process - becoming organic and unique. The work can look extremely fragile, but as it has been fired to cone 10, it has an unexpected strength to it.